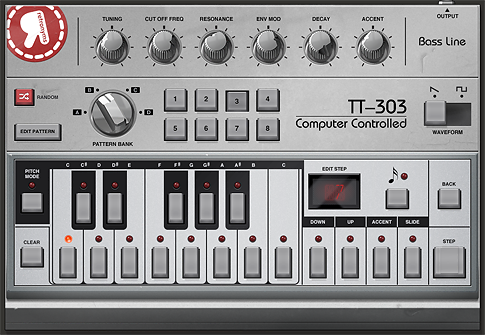 This drum machine is similar to other 16-step pattern machines but allows you to layer multiple tracks on a step. Each drum kit comes with eight tracks, just turn the track wheel to select the track and tap the step where you want to hear the sample. You can design and save your own custom kits by loading samples from the factory kits, importing your own sounds from iTunes or AudioPaste, or recording from Recorder M2. There are five parameters that can be adjusted for each step - distortion, length, balance, pitch and level. Use the master param wheel to make global changes, or use the slider above the step to change just one step. There are also dedicated outputs for tracks 1-4 if you want to add an effect to that track, but routing a track through its dedicated output removes its signal from the master output. Store eight patterns on the device, with all the normal Edit Pattern functions of shifting left or right, cut/copy/paste/clear, and setting the steps to either an 1/8 or 1/16 note interval. A faithful reproduction of the classic 16-step pattern machine, tap step to advance the step or back to go back, and tap the desired pitch from the keyboard layout. Don't forget to tap the note button next to the Edit Step LED to enable the step! Apply an accent and/or slide to the note, shift it up and/or down an octave, and switch between triangle and square waveforms to switch up the sounds. Store eight patterns in four different banks (A-D), just turn the knob and tap the numbered button to load up a pattern or make a new one. Take advantage of the set of controls at the top of the device that allow you to further vary your beats: tuning, cutoff frequency, resonance, envelope modulation, decay and accent. It has the familiar Edit Pattern menu, but in addition to the interval, shift left and right, and cut/copy/paste/clear, there are the options of randomizing and altering the pattern, accents and/or pitches and transposing the pattern. Transposing the pattern moves the pattern up or down anywhere from one semitone (a half step) to twelve semitones (an octave), but you've got to tap Apply Transpose for the changes to apply. Tapping randomize will change the pattern/accents/pitches completely at random, while alter is a little more subtle and makes changes while preserving the basic gist of the pattern. And that little red Random button above the Edit Pattern button is a shortcut for going into the Edit Pattern menu and selecting Randomize Pattern. This one is so much fun! Route up your signal and hold down the blocks to add the effects. Top blocks play the 1/4, 1/8, 1/16 or 1/32 beat forward (left/green) or in reverse (right/yellow), and bottom blocks apply a low pass (left/blue) or high pass (right/red) filter to the incoming signal. Hold multiple blocks at a time to really change it up. 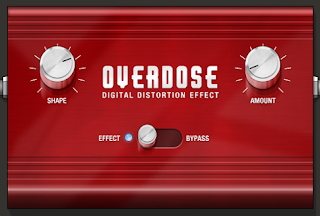 You've been asking for this for a while, and now it's finally here - a distortion effect to make your sounds as gritty as you want. Shape increases the intensity of the distortion, amount applies more of the effect. 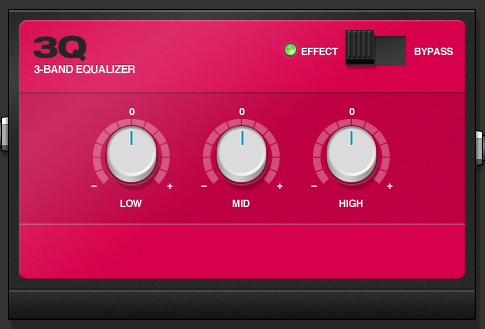 Another oft-requested feature now realized, here's the EQ to tweak the lows, mids and highs of all your sounds. Available from the settings menu in the tabletop transport bar, you can now move the track forward on the note! 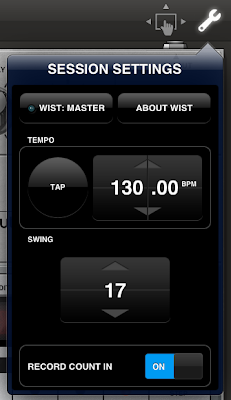 We've also extended the tempo range to allow for tempos as low as 40bpm. And in addition to all these things, we've got three new demo songs and a ton of other content. There are new factory presets in M8RX along with content from Oh No (XOX), Salva (M8RX, RS3, Gridlok), +Verb (XOX) and Pete Sasqwax (XOX). Swing and Tempo - Free! We're also having a couple holiday specials, the app itself is on sale for $0.99 (down from $14.99) and we're having a sale on the RS4000 Subtractive Synthesizer - it's now $6.99 (down from $9.99)! Take advantage of all the new devices and put them to good use in the Tabletop contest on SoundCloud. Submit your best Tabletop tracks by January 21, 2012 for a chance to win a SoundCloud Pro Membership (over $300 value)! Tracks must be made exclusively in Tabletop (but you can use imported samples), and we'll be selecting the winner based on your comments and votes. This version also has support midi? or a way to get midi events in?